Sinking in scandal, Kwame Kilpatrick tendered his resignation as Mayor of Detroit on 4 September 2008 (effective two weeks later). He agreed to plead guilty to obstruction of justice, pay a $1M fine, and forfeit his law license, in exchange for a four-month prison sentence. He was then sued for shuffling money into his wife's bank account to avoid paying the $1M he had agreed to pay. On 25 May 2010 a Wayne County judge ordered Kilpatrick to spend at least 18 months in prison for violating his probation terms, by not disclosing assets. 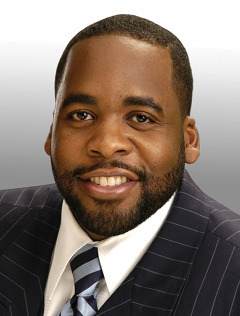 In a separate matter, in 2010 Kilpatrick was charged with ten counts of mail fraud, three counts of wire fraud, five counts of filing a false tax return and one count of tax evasion over an alleged scheme in which he funneled charitable donations to his tax-exempt Kilpatrick Civic Fund to his personal use and into his campaign funds. He was still in prison over the probation violation when the 2010 charges were filed, and months later, another 38 further charges were filed against Kilpatrick, his father, and several alleged co-conspirators.